Blockchain technology is the next big thing. It is defying industry norms and altering the manner in which industries implement new projects. The decentralized nature of blockchain technology is the key to its success. Blockchain is transforming every organization through its secure and decentralized protocols, protected peer-to peer applications, and a new approach towards distributed management. 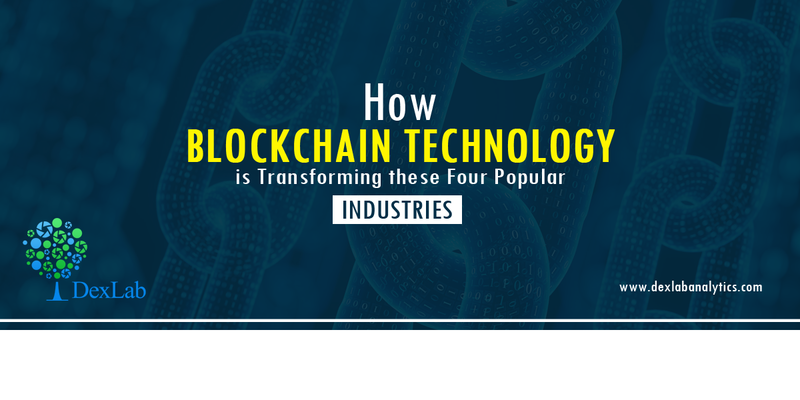 Here are some everyday industries that blockchain technology is revamping. There are all kinds of opinions regarding how cryptocurrency is impacting macroeconomics pertaining to the financial sector. The rapidly increasing demand for Bitcoin signals a flourishing future for cryptocurrency. In 2017, ICOs (Initial Coin Offerings), which are means of crowd funding centered on cryptocurrency, raised more money than venture capital investments. Cryptocurrencies, like Bitcoin, Ethereum and Ripple are improving their speed for processing transaction fees, and will be able to contend with speed of transaction for credit card companies in the near future. Bitcoin permits people to transfer money across borders instantaneously and at low costs. Many banks, such as Barclays, are set to use blockchain technology to facilitate speedier business procedures. The evolution of cloud has outmoded hard drives, which was the popular choice for transferring files from one computer to another, even a few years ago. Blockchain-based companies, like Akash, want to seize this opportunity and create an open market place where cloud computing costs are determined by demand and supply, instead of centralized, fixed prices. Most large-scale data centers depend on idle computing power. Akash Network makes idle server capacity available for cloud deployments. This system enables users to ‘’rent’’ idle computing power and providers to generate revenue from their idle power. Developers specify their deployment conditions in a file that is posted on the Akash blockchain. Providers capable of fulfilling these conditions bid on it. Low bid wins; after this parties go off chain to allocate workload in Docker containers. Akash tokens are then transferred from tenant‘s wallet to provider’s wallet. The online sports industry is embracing the blockchain technology. An increasing number of developers in the world of e-Sports are employing blockchain technology and cryptocurrencies. Leading fantasy sport companies, like MyDFS, permit their users to create virtual arrays of real players and obtain winnings through tokens. In-app purchase is the newest monetization model for Smartphone app games. Blockchain technology is also advantageous for e-Sports betting platforms. The tech constructs a secure environment for low fee betting that is free from the control of a central party. One of the most famed features of blockchain is decentralization. The thought of decentralized, autonomous organizations is no doubt very fascinating, but they are very difficult to establish. A hierarchical structure, where one person or group tends to dominate, is very natural. However, new and advanced frameworks are facilitating decentralized platforms to function effectively. An example of such a framework is DAOstack, which is striving to build a platform that enables collectives to self-organize around similar goals and interests. It is a platform that authorizes emerging organizations to select suitable governance model that will work for them and execute the same through DAOstack’s technological protocol. DAOstack’s founding principle is collaboration- it aims to provide a setting where goals of individuals can work in harmony with goals of a group. The ‘’blockchain boom’’ is driving breakthroughs for a range of industries. This is just the beginning, though. As this tech evolves, it will enable rapid progress across every industry. To read more blogs on emerging technologies, follow DexLab Analytics; it is a premier institute providing data science certification courses in Delhi. Do take a look their data analytics certification courses.